As a result of Luke Skywalker's daring rescue of Han Solo from the clutches of Jabba the Hutt, Boba Fett was thrust into the Great Pit of Carkoon and presumed to be a victim of the dreaded Sarlacc. Sometimes later, the notorious bounty hunter was spotted on Nar Shaddaa with a menacing-looking weapons pack. Several rumors have been spread concerning his recent escape and present situation, the most prevalent one being that the Hutts have contracted him to capture Han Solo and Princess Leia alive for the death of Jabba. 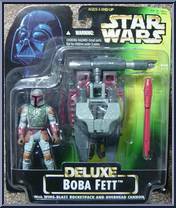 A weapons master, Boba Fett has a veritable arsenal hidden throughout his Mandalorian armor. His new pack is reported to possess powerful turbo thrusters that provide prolonged atmospheric flight up to 500km per hour. Shielded battlewings open to reveal missile racks loaded with concussion rockets, while heavy-rotating blasters, similar to those mounted on Jabba's sail barge, respond to optically-activated signals in the helmet. Certainly the deadliest feature of this device/vehicle is the bolstered proton torpedo launcher. 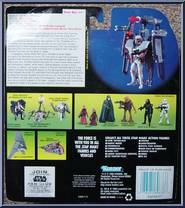 It is estimated that this pack was designed and built by Boba Fett himself: besides that fact that not one of its kind has ever been seen before, the type and variety of its weaponry - few other than Fett would dare carry a proton torpedo on his back - suggest that this battle machine be a signature model of the galaxy's most notorious bounty hunter.